On October 8, 2015, when the Church commemorates the repose of St. Sergius of Radonezh, the Wonder-worker of All Russia, Metropolitan Hilarion of Volokolamsk, head of the Moscow Patriarchate department for external church relations (DECR), with the blessing of His Holiness Patriarch Kirill of Moscow and All Russia, led the faithful in celebrating the Divine Liturgy at the church of the Descend of the Holy Spirit of the St. Sergius Laura of the Holy Trinity. In his sermon after the service, His Eminence Hilarion spoke about the life of St. Sergius, dwelling on the spirit of meekness that he developed through his long and difficult monastic life. ‘It is this spirit of meekness that the saint used to heal the weaknesses and sins of his fellow monks’, he said. ‘It is very difficult to stop animosity and reconcile the quarrelling parties… The only way to secure reconciliation is to follow the command of St. Paul and reform a sinner by the spirit of meekness, not condemnations or persuasions, but the spirit of meekness, the spirit of the inner spiritual peace that our Lord Jesus Christ has given to people. He said to His disciples, Peace I leave with you; my peace I give you. I do not give to you as the world gives (Jn. 14:27). ‘Now we will come out to the square and, together with his Holiness the Patriarch, numerous bishops and priests and thousands of pilgrims, will lift up an ardent prayer to the saint that he may preserve our Holy Rus’ united and indivisible, that every enmity may stop in our homeland, that the Lord may pacify people’s hearts and make rulers take right decisions, that God may preserve Holy Rus’ for centuries in the Orthodox faith’. 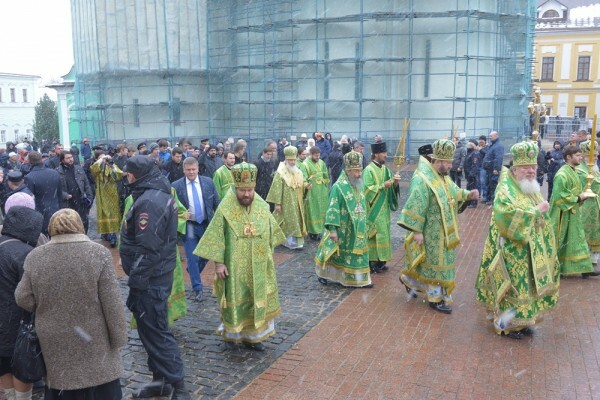 After the liturgy, His Holiness Patriarch Kirill of Moscow and All Russia and all the bishops who celebrated in the monastery’s churches came out in a procession with the cross and the venerated icon of St. Sergius of Radonezh to the Laura’s square, where Patriarch Kirill led the faithful in a thanksgiving. His Holiness Patriarch Kirill addressed the faithful from the balcony of the Patriarchal chambers.